“Languages play an important role in the daily lives of people. Not only as a tool of communication, education, social integration and development, but also as a repository for each person’s unique identity, cultural history, traditions and memory. But despite this immense value, languages around the world continue to disappear at an alarming rate. 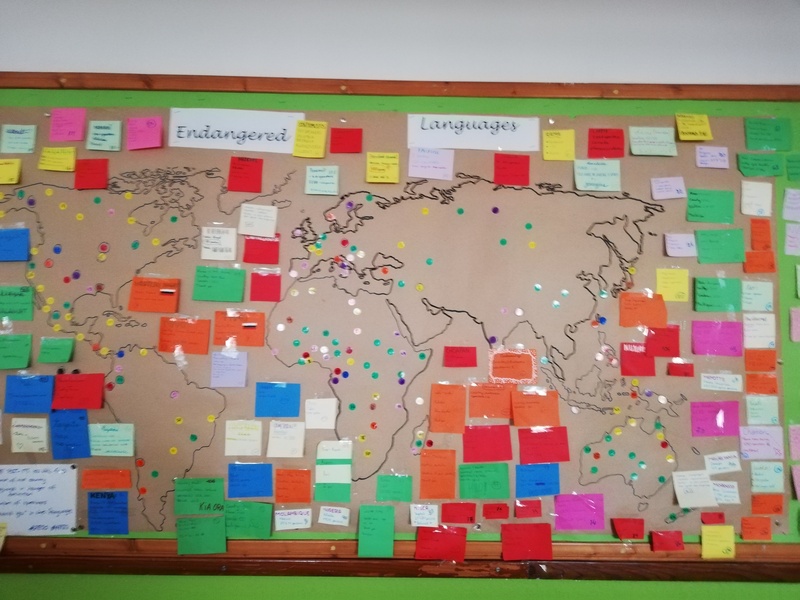 And with this topic, and in order to participate in the contest THE FONIX 2019 we have worked in this project with the ESO1 and ESO2 students (ages 12-14), in order to raise awareness of the importance of preserving languages around the world. We have looked for languages in danger of extinction, around the world. We have found where they are spoken, how many people still speak them and how THANK YOU is said in that language. With this information, we have created a big world map and have situated la languages on it. Our second activity consisted of reading several articles and drawing MIND MAPS with their information. They were about different ideas to protect endangered languages. Next activity was about creating posters with ideas to preserve the languages. Now, we have to choose the best one for THE FONIX 2019 contest. But, no matter if they win or not, our students have done a VERY GOOD JOB, we have learnt more about languages around the world, we have been aware of how important it is to preserve all languages… and we have had GREAT FUN!